How do you measure a great hotel? Is it the architecture, the food, the thickness of the towels? There's no arguing that the grand lodge of Yosemite National Park is the Awahnee (ah-WAH-nee) Hotel. 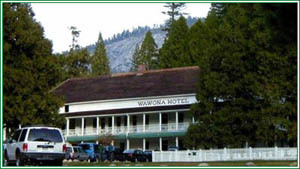 But often overlooked is the Wawona (wah-WOH-nuh) Hotel. Still inside the park, it lies thirty miles from the famous Yosemite Valley. It's not particularly elegant but other qualities make it worth considering...as the Open Road's Hal Cannon and Teresa Jordan discovered. Hal: The Wowona is more Yankee or Plantation south than lodge rustic - acres of lawn, white clapboard buildings with long porches, wicker furniture and Adirondak chairs. But the trees root you firmly here, in Yosemite: towering incense cedars, Ponderosa Pine, and the lord of all, the Giant Sequoia. In fact, Wowona means "big tree." Teresa: We check into our Victorian room: whitewashed furniture, William Morris wallpaper, flowered damask bedspreads . I've never been one for that bed & breakfast style where, by the time you get all the pillows off the bed, naptimes over. But this room doesn't seem quaint so much as caught in time. Hal: With no TV or phone in our room, we make our way back down to the lobby. It's mobbed, people playing backgammon, and cards, drinking cocktails on the porch, reading books in overstuffed chairs around the hearth. And not a seat in the parlor as a piano player accompanies one of the guests. Hal: The next morning, chief maintenance man Marvin Kramer broadcasts his own flag raising ceremony over his walkie-talkie throughout the hotel. Teresa's out walking the grounds. Teresa: It's a beautiful morning at the Wawona. There's just the beginning of this beautiful golden light coming in at a slant over these green swards of lawn. And the buildings are looking so white and ancient and inviting. Hal: I'm curious about this place. It doesn't seem quite real. I wonder if anyone else feels it. Guest #1: "The hotel is like, the only thing I can compare it to is Gone with the Wind. I keep expecting Clark Gable to come walking through." Guest #2: "Someone mentioned Gone with the Wind but my husband and I were thinking, Somewhere in Time that movie. We felt like we'd been taken back in time." Mike Bruneer: "This is almost like Hotel California. You can check out any time you like but you can never leave." Hal: That's Mike Bruneer, the executive housekeeper. He came to work here almost 20 years ago and never left. Mike Bruneer: "When I came I had a little case of high blood pressure, and within a month it had gone down 20 points. There's just no tension here." Teresa: Maybe this is the Enchanted Forest. I look at the staff and begin to wonder if they are guests who just stayed on. Waitress, Sue Gaines worked here as a college student where she met her husband. Sue Gaines: "And we were married 35 years and I lost him during a stem cell transplant in 1998 and decided that I needed to go somewhere that was happy." Hal: Each night Tom Bopp sits down to an old Knabe parlor grand piano and casts a spell. Tom Bopp: "This little magical transition takes place that we go from a nostalgic sort of stance to people just enjoying the songs." Teresa: Tom understands why this place is so homely. Tom Bopp: "It's a grandmotherly old hotel, and you behave yourself when you're at your grandmother's house and you respect the place." Hal: Over the years Tom's seen managers come and go, all trying to improve on the Wawona. But, he maintains, the hotel insinuates itself on everyone here. Tom Bopp: "It says, no, you're not gonna get away with TV sets in the rooms, and you're not gonna get away with telephones. It still operates under the original premise for which the hotel was built." Teresa: And that premise is that you are here to relax and leave the pressures of the outside world behind, to let these big trees work their magic. And while you're at it, share the enchantment with your fellow travelers. I'm Teresa Jordan with Hal Cannon for the Savvy traveler. The Western Folklife Center's Open Road is produced by Taki Telonidis with support from the George S. and Dolores Dor'e (DOOR-ee) Eccles Foundation.